June, 2018 marked the 70th anniversary of The Chicago Bar Foundation. 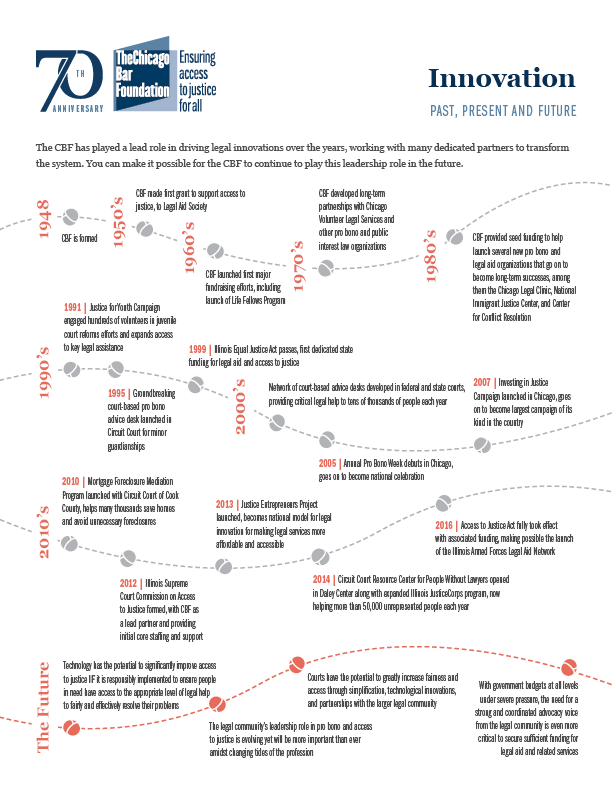 Thanks to your strong support, the CBF has been bringing Chicago’s legal community together since 1948 to improve access to justice for people in need and make the legal system more fair and efficient for everyone. Along with our enduring support for pro bono and legal aid in the Chicago area, and the annual Investing in Justice Campaign that provides the core of that support, the CBF addresses larger systemic issues—like the explosion in unrepresented people in the courts—through community leadership and by developing new solutions for access to justice. We also advocate within the courts and at all levels of government for laws and policies that make the justice system more fair and accessible. We helped develop and advocate for legislation that created the Illinois Armed Forces Legal Aid Network, a new legal hotline and coordinated network of services for veterans and military families that is the first of its kind in the country. The CBF’s Justice Entrepreneurs Project is an internationally recognized incubator for newer lawyers to start innovative, socially conscious law practices in the Chicago area that provide affordable services to low and moderate-income people. We have worked with the courts and other partners to establish a network of legal advice desks that help many thousands of people without lawyers in the state and federal courts every year. The CBF is now the largest voluntarily supported bar foundation in the country, recognized as a local and national leader on access to justice issues and an international model for innovation in this work. The dedication and shared commitment of Chicago’s legal community make our work possible, and leaders from throughout that community are involved. Brett Hart, Vice President and General Counsel of United Airlines, and Tina Tchen, a Partner at Buckley, are co-chairing a special fundraising drive in honor of the CBF’s anniversary, which will help make it possible for the CBF to continue developing innovative new projects that transform access to the justice system. The CBF’s work is now more important than ever in the face of the reality that so many people still can’t afford legal help when they need it. As we look ahead to the next 70 years, with your continued partnership and support, we plan to meet that challenge head on with innovation, creativity and determination. You can get involved or learn more about CBF’s work and the comprehensive strategic plan that guides it.